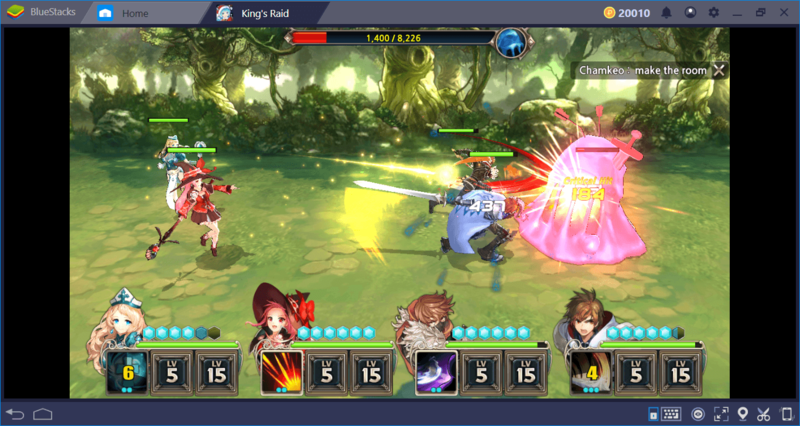 King’s Raid is one of the most popular mobile games among the newly released RPG games and offers a huge world to discover. If you’ve just started playing, you can learn everything you need to know about the game by reading our review. 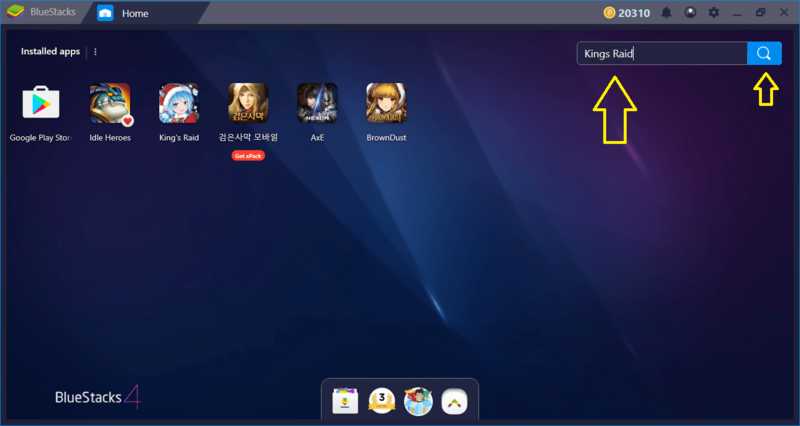 But first of all, let’s talk about how to install and configure King’s Raid on BlueStacks because our exclusive features such as combo key and keymap tool will allow you to play this game much more pleasantly and efficiently. Enter the name of the game in the BlueStacks search box and press “Enter”. Within a few seconds, the results will be displayed: After that, all you have to do is press the “Install” button. The game is about 2 GB in size but if you are ready to sacrifice the graphics quality, you can choose the 1.5 GB package. We are writing the name of the game in the search box. You can play a mini-game while the download continues. 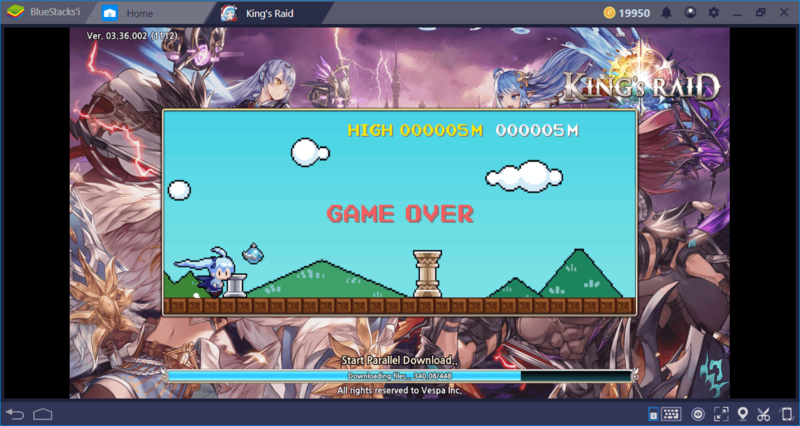 When the download ends, BlueStacks will automatically complete the installation and notify you when your game is ready. 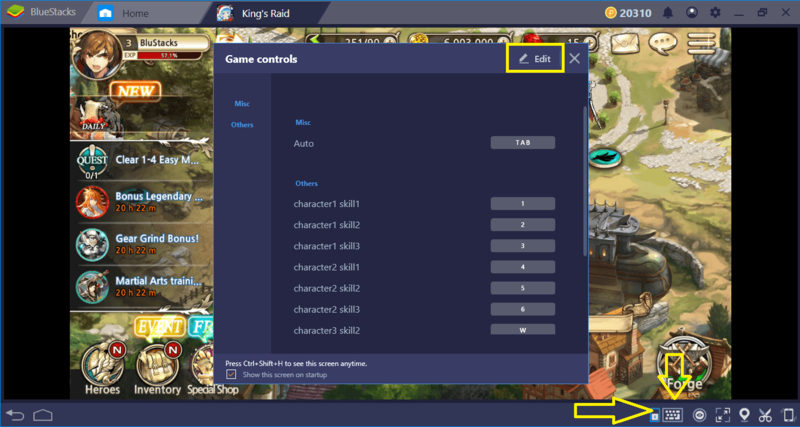 Now, you’re ready to start: Let’s personalize King’s Raid and start playing. 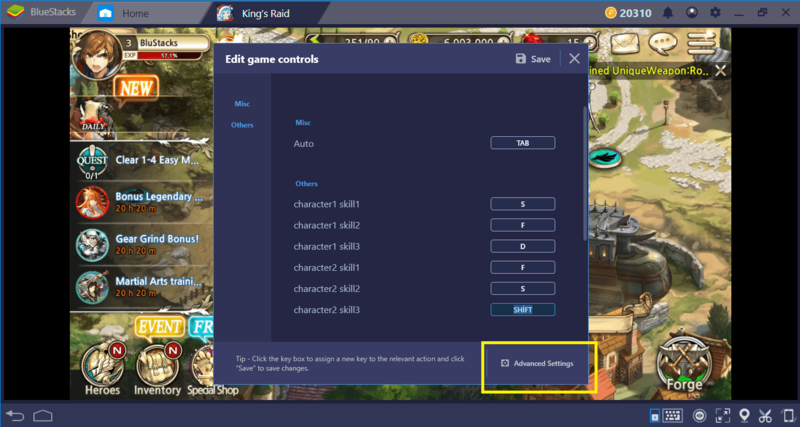 BlueStacks, by default, offers this control scheme for King’s Raid. Battle screen. Take a look at the skill buttons at the bottom of the character portraits. You can use all of them with the keys in the default control scheme. You can change the default controls by pressing the “Edit” key. Remember to press “save” after making changes. You can also use our “advanced keymap tool” to further personalize the controls and set tap spots on the screen, for example. To start, open the default scheme screen and click the advanced settings link. You can set a button for any function and place it anywhere on the screen. You already know how Combo Key works: Thanks to this feature, you can record any series of actions and repeat them at any time. 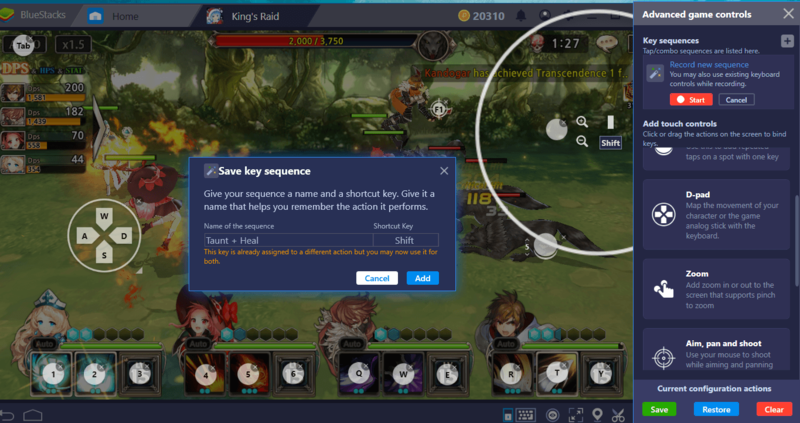 We usually recommend using Combo Key for repeatable missions, but you don’t need this in King’s Raid: The game already offers the option to automatically repeat a mission you’ve already completed. However, the Combo Key feature still offers an advantage: You can create special skill combinations with it and make-up to four attacks by pressing a single key. 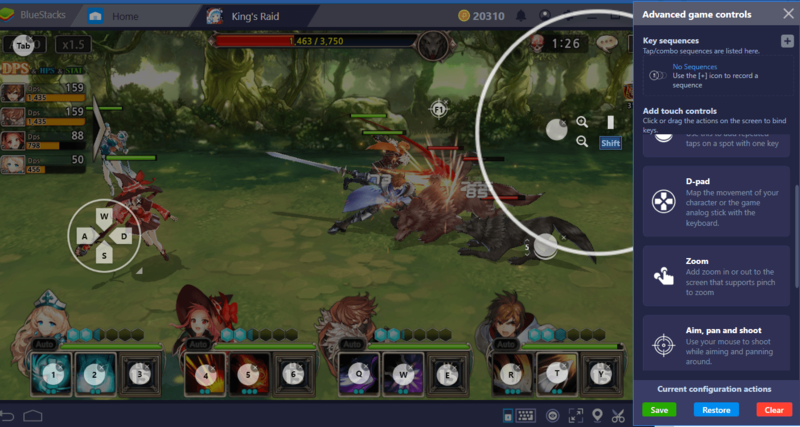 As we mentioned in our Tips and Tricks guide, King’s Raid battles take place in real time and your response time is important. For example, the tank will receive high damage after using the taunt skill, so the healing ability should be used immediately after. During the battle, you can forget this or react late, both of which will not be good for you. However, with Combo Key, you can easily perform this skill combination. Start recording and use your skills. In this example, we are only recording taunt and heal abilities, but you can extend this chain as many times as you like, and for example, add a DPS skill. End the recording and give this combo a name. In the future, you can repeat all the included abilities in a single keystroke. This method will be particularly useful for finisher moves in boss battles. 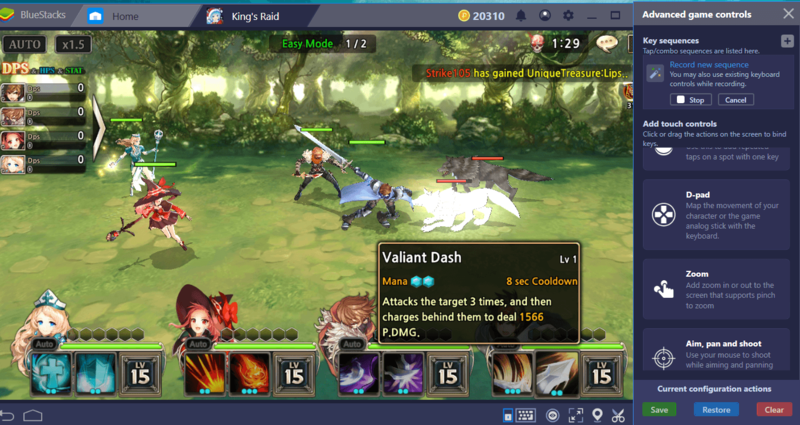 Using BlueStacks, you can make King’s Raid more enjoyable and automate many features. Let’s give you one last tip: If the game doesn’t support your local language, BlueStacks can instantly translate it for you. To learn more about this feature, we suggest you take a look at the article we’ve prepared. Now, you are ready to start your adventure in King’s Raid: Read our other guides about the game to continue and save the world once again!